The 49.9 metre motor yacht My Dream, listed for sale by Jimmy Frangi at SSH Maritime, has been sold with Simon Goldsworthy at Camper & Nicholsons acting for the buyer. My Dream was designed by Progetti & Associati and built in steel and aluminium by Italian yard Ortona Navi with delivery in 2008. Weighing in at 591GRT and Germanischer Lloyd’s classed and Malta Commercial certified, My Dream can accommodate 12 guests in six cabins plus 11 crew members. The accommodation consists of an impressive master suite on the main deck, a VIP suite, two doubles and two twins and all cabins have full en suite facilities. The interior is modern and stylish, with large windows offering plenty of natural light to the interior. The ample aft deck has a large settee and al fresco dining for 12 while a large sun deck offers an eight person Jacuzzi and plentiful sunbathing areas. 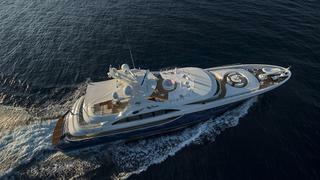 Twin 1,575hp Caterpillar diesels give her a cruising speed of 12 knots and a cruising range of 3,800 nautical miles. She is fitted with zero speed stabilisers and in 2014 she had an extensive refit costing in excess of €4.5 million.